If you are familiar with my list of Best Apps for Toddlers you’ll know that the original Nampa App, Nampa Forest, received a raving review from me earlier in the year. 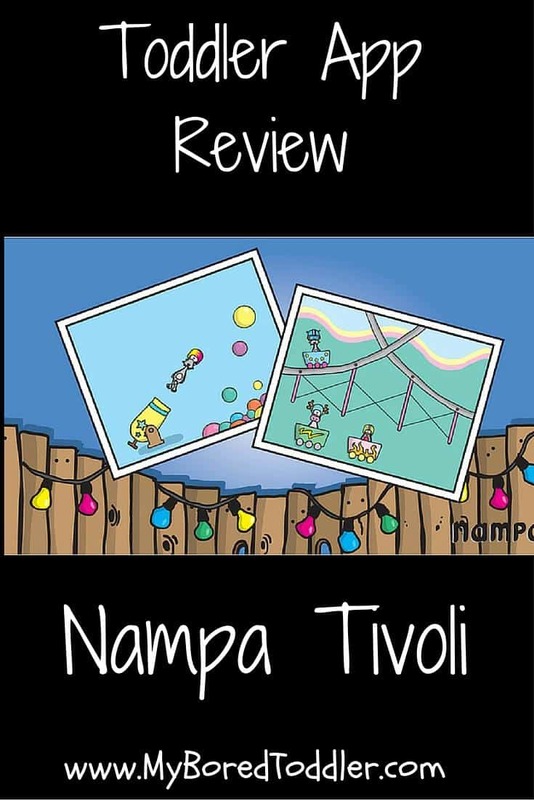 It is exciting to announce that there is a new Nampa App called Nampa Tivoli. This week my kids and I have been reviewing the app (which really means my kids keep taking my tablet off me because it is their turn to play and I have to watch over their shoulder!). The app is available from iTunes and the Google Play store. It is a paid app, but as I have mentioned a lot, when it comes to finding quality children’s apps, paid is generally the best way to go as it ensures that you get the full version and no in app purchases. Nampa Tivoli consists of six mini games including decorating your own rollercoaster, running an ice-cream stand, a mirrored room and a magical disco room. As someone who loved the Tivoli amusement park in Copenhagen, I have really enjoyed sharing this app with my kids. It reminds me of all the fun times I had there. They love the different activities and especially enjoy the music and disco dancing that is a part of each mini game. Decorating their own roller coaster was the clear favorite game with my 3 year old, while my 1 year old couldn’t wait for the disco dancing! She also enjoyed the ice cream stand game. One of my favorite things about the Nampa apps are that there is no opportunity to fail. Each game is a lot of fun with no winners or losers at the end, and no scoring. As always there’s lots of disco dancing too! With no speech or text, this app is a great universal game. Another great feature is the beautiful illustrations that Nampa are becoming known for. This app is definitely one that I would recommend for children under 5 and will be added to my next ‘Best Apps for Toddlers’ list (coming soon!). You can download the Nampa Tivoli app from iTunes or Google Play. Make sure you also read our review of Nampa Forest and visit our Top 20 Apps for Toddlers.